Anchoring operations planning consists of information, instructions and actions which contribute to a procedure for manoeuvring the vessel to the designated anchor position and successfully anchoring in a safe, seamanlike manner taking the prevailing weather conditions and sea state into consideration. Maintaining a safe operation All checks, inspections and calculations as per Arrival Check List must be completed in sufficient time so as not to interfere with a smooth, planned approach. The company's risk management system must be complied with. Keep the engine room fully advised of the vessel's progress especially when entering: shallow water, high risk areas, restricted or confined waters. As far as circumstances permit, maintain good communication with the Port Authority and/or Vessel Traffic Services (VTS). Request any information regarding shipping movements which could affect the safe progress of the vessel to the anchor position. The vessel will now proceed to the designated anchor position and anchor as per planned method. report to the bridge "Anchor(s) clear of hawse pipe and ready for letting go"
await further instructions from the bridge. Always be alert to any changing circumstances e.g. excessive vibration or unusual noise of machinery. Once the planned length of chain is in the water the guillotine bar should be dropped and secured, and the chain allowed to bear against the guillotine bar. The guillotine bar is designed to take the weight of the anchor cable. The windlass should be out of gear and the brake applied. Throughout anchor period the appropriate anchor signals are to be used (ball, lights, bell and gong). escape / abort route should circumstances dictate. Preparing and lowering the anchor: When the anchor party has been briefed, the Officer in charge will first establish communication with the bridge prior to proceeding forward. 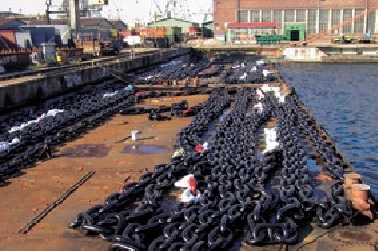 Prior to arrival at or off the port, both anchors are to be cleared ready for use. Anchors should only be cleared when the water depth will allow recovery of the anchor and cable in the event that they are accidentally let go.An anchor marking buoy is to be available and ready for use. ensure “D” and crown shackle pins in place and tight. Under the direct supervision of the officer in charge, the procedure for preparing and lowering the anchors can be completed. Particular care must be taken when the weight of the cable is secured by the windlass brake only. The anchor party must be alert to any changing circumstances. Arriving at the anchoring position: Prior to anchoring, the direction and speed of the current or tidal stream and wind must be confirmed. Attempts should not, whenever possible, be made to anchor across the current, tidal stream or wind. When all the way has been taken off the vessel, the vessel's head should be close to the direction of the tidal stream or wind and the bow should not be swinging excessively. It is suggested the use of radar parallel indexing technique, an effective tool in maneuvering approach to anchoring position. A fix reference point is necessary in establishing the intended anchoring position relative to this fix point. The Chief Officer (or another experienced officer in lieu) must supervise letting go or weighing the anchors and should only assign experienced crew members to anchor work. e.	Ensure all personnel are wearing Safety Helmets, Safety Shoes and Goggles. The Chief Officer shall confirm that there is no craft or any obstacle under the bow and inform to the Bridge. The Master shall ensure that the vessels GPS speed at the time of anchoring is near-zero or indicates a slight sternway. The speed should be verified by visual transits and/or Radar ranges of Landmarks, if available or other fix conspicuous targets. Where means of communication between Bridge and the Anchoring party is by Portable radio, the identification of the ship should be clear to avoid misinterpretation of instructions from other user of such equipment in the vicinity. f.	Bring anchor cable direction forward and confirmed anchor holds its position. If the brake fails, or there is too much speed over ground, the cable will run out to the bitter end with consequent damage. The brake lining could also be damaged due to this Dynamic load (the Static load on brakes to restrain movement of an anchored vessel is much less). b. Walk out the anchor under power until the complete length of required cable is paid out and anchor holds it position on the seabed. c.	Bring anchor cable direction forward and confirmed anchor holds its position. Vessel must be completely stopped to avoid major damage to Windlass. VLCCs, because of their inertia require great caution while anchoring. They can suffer equipment failure if attempting to anchor whilst moving at speeds as low as half a knot over the ground. Hence, the vessel must be nearly stopped not only in the linear direction but axial too, meaning the bow should not be swinging much either while anchoring. 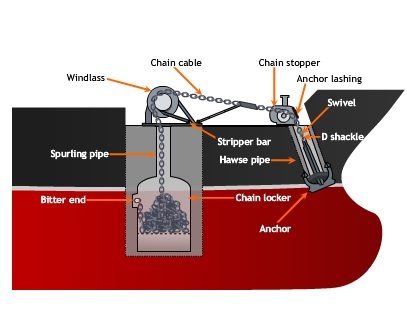 The depth at which the vessel can safely anchor is about 110m or less, beyond which the windlass may have extreme difficulty in recovering the anchor. Refer Further Practice of anchoring / VLCC in deep water for more details. Anchors should be ready for letting go on arrival and departure port, when in anchoring depths. At least, any wire lashings are to be removed and the anchors held on brake. 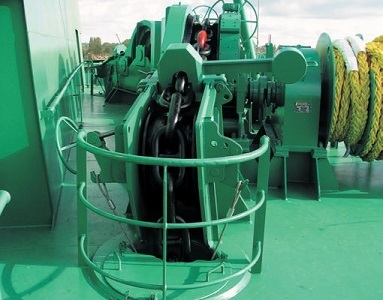 In critical situations, to arrest the movement of the vessel, after stopping/reversing the main engine , it is preferable to let go both anchors simultaneously instead of one. The stay and direction of the cable and the residual shackles are to be continuously reported to the bridge. Anchor Wash to be run to clean the chain and the anchor. When anchor is fully hove, the brake is to be applied and the windlass taken out of gear. The bow stopper is to be put when it is deemed safe to do so.